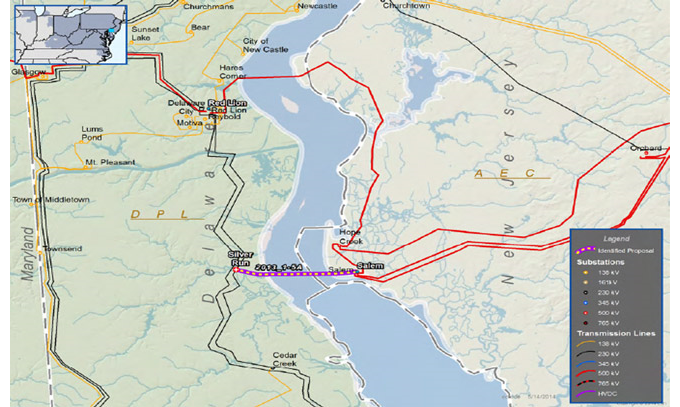 Click to OpenArtificial Island Project on Delmarva PeninsulaThe PSC has received two CPCN applications for new and modified transmission line projects, both from Delmarva Power since early 2014. Church to Steele is a rebuild of an existing 138 kV transmission line from the Church Substation in Queen Anne’s County to the Steele Substation in Caroline County. The Church to Steele project received CPCN approval from the PSC in 2015. Piney Grove to State Line is a new 138 kV line of about 25 miles in Maryland. It begins at the Piney Grove Substation in Wicomico County and terminates at the Maryland/Delaware state line. The entire project extends to the Wattsville Substation in Virginia. PPRP has completed its review of the portion in Maryland; the PSC issued a Proposed Order on August 18, 2016 giving Delmarva Power its CPCN for the project. Transmission planning and regulatory drivers, as well as oversight, are described in Section 3.3. The Delmarva Peninsula, consisting of Maryland’s Eastern Shore, Delaware, and a portion of Virginia, experiences high congestion costs due to the isolation of the transmission system. As noted in the figure below, the entire Delmarva Peninsula relies upon a transmission interconnection at the northern part of the Peninsula in Delaware. The lack of transmission interconnection points elsewhere on the Peninsula causes increased transmission congestion. While projects, such as the Mid-Atlantic Power Pathway (MAPP), have been proposed in the past, none have come to fruition. 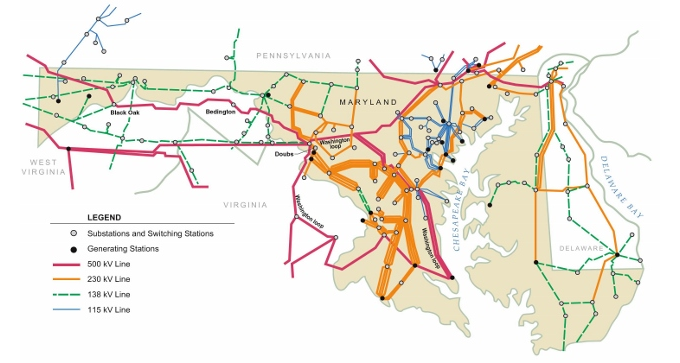 Instead, reliability improvements in surrounding areas, such as Central Maryland, serve to strengthen reliability on the Peninsula and reduce outage risk until the need for another transmission interconnection point to allow additional imported power onto the Peninsula is identified. One project, the Artificial Island project, proposes the construction of a new underwater 230 kV transmission tie from the Salem and Hope Creek nuclear power plants in New Jersey to the western side of the Delaware Bay. This project, if it proceeds, is expected to address stability issues at the plants while increasing their generation output; however, PJM recently put the project on hold to allow further evaluation.The second proposed project is the construction of a pair of 230 kV transmission lines, one from Pennsylvania to a BGE-owned substation in Central Maryland and the second from Pennsylvania to a PE-owned substation north of Hagerstown. Although neither of these projects are located within Maryland’s Eastern Shore, each would provide stability to the transmission system that supports the Delmarva Peninsula’s transmission lines and would assist in mitigating power outages. Source: “PJM Staff Picks LS Power for Artificial Island Stability Fix; Dominion Loses Out,” Herel, Suzanne, April 28, 2015, RTO Insider, http://www.rtoinsider.com/pjm-ls-power-artificial-island-14775/.